Wheat protein is popular among athletes and fitness enthusiasts as it assists in increasing lean muscle mass and decreasing body fat. A study by researchers from the Maastricht University has also found that older men consuming a large quantity of wheat protein witnessed gain in muscle size. However, a number of studies are still ongoing on how wheat protein helps in losing unwanted body fat while preserving lean mass. Protein bar manufacturers are also focusing on producing high protein bars including wheat protein and milk protein. Hence, incorporation of protein in the mainstream confectionary will likely add to the growth of wheat protein market. The demand for energy boosting snacks with wheat protein has also increased globally, further accelerating the growth in the wheat protein market. Hence, wheat protein is being used to create snacks such as sports drink, bars, and smoothies. Infant formula manufacturers are adding wheat protein as the main type of protein as it is beneficial for babies prone to acid reflux. It is also considered better for infants with a family history of food and milk allergies. Hence, the increasing use of wheat protein in baby formula is likely to create growth opportunities in the wheat protein market. Moreover, wheat is easier to digest than casein, hence, manufacturers are adding wheat protein to infant formula in order to reduce tummy troubles. The European Food and Safety Authority (EFSA) has also confirmed wheat protein as a safe ingredient in infant formula and food supplements under proposed use levels and uses. Also, alpha-lactalbumin, a type of wheat protein added in infant formula has shown better results. Baby formula manufacturers are constantly working on introducing new products with higher wheat protein and lactose to match the content found in breast milk. According to the FDA Voluntary Cosmetic Registration Program database, wheat protein is used prominently in face and neck skin care products. Functioning as a skin-softening and hair conditioning agent, wheat protein is being used as an ingredient for cosmetics formulations. Wheat protein is also used in hair care products to overcome problems like hair loss, bald patches. Wheat protein is being added in cosmetics to introduce a new range of cosmetics that offer anti-aging, anti-bacterial, anti-inflammatory, and moisturising or cleaning. Wheat protein market is witnessing growing demand from cosmetics manufacturers as they are moving from chemical formulation to natural sources. Gluten intolerance is emerging as the common problem resulting as the adverse reaction to gluten, a protein found in wheat and barley. A study presented in Digestive Disease Week found that the increasing number of people in the US avoid gluten because of gluten sensitivity as compared to a celiac disease. Increasing prevalence of gluten intolerance and rising adoption of gluten-free is significantly driving the availability and sales of gluten-free products. This has emerged as one of the biggest challenges in the wheat protein market. According to the article published on Global Prevalence of Celiac Disease, factors responsible for celiac disease include pattern and age of wheat consumption, infant feeding practices, and gastrointestinal infections. Also, the rise in the production of gluten-free products with improved taste, nutrition and quality is hampering the growth of the wheat protein market. According to the Innovation Center for US Dairy, ongoing research on the quality of wheat protein is creating opportunities to improve aroma, flavour, performance of this ingredient in high-protein beverages and foods. For instance, research resulting in improved heat stability in wheat protein helps to significantly increase protein content in various nutritional beverages. Developed specifically for use with wheat protein, Glanbia Nutritionals in 2016 introduced EasyFlav Whey technology to be used in wheat protein products. This technology reduces 30% of carbohydrates allowing manufacturers to provide pure protein products. Similarly, manufacturers in wheat protein market are developing new and commercially relevant wheat processing technologies, along with the development of new wheat protein fractions in food applications. Thus resulting in the use and development of innovative technologies to fuel wheat protein market growth. The wheat protein market is highly fragmented and the major market players are using various strategies such as developing and launching new products, partnerships, joint ventures, and acquisitions to establish themselves in the global market. The report provides detailed profiles of all the leading market players in the wheat protein market. Cargill Inc. acquired Konspol, a major Polish chicken producer and establishing its first protein business in Europe. Cargill will also take over operations of five broiler farms, feed mill and two processing facilities to further expand its business. 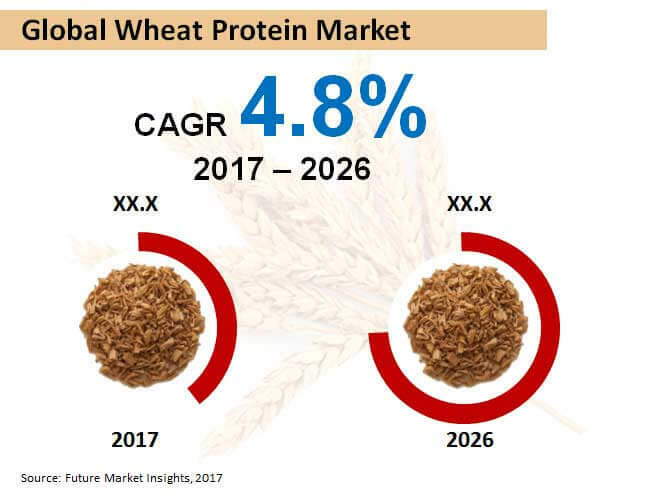 Driven by factors such as surging consumer preference for nutritional benefits & meat analogs, soaring bakery industry, and growing applications of wheat protein across a diverse range of industries, demand for wheat protein has been on the rise. Adoption of wheat protein is also expected to be fuelled by high consumption of plant-based protein on the back of diseases such as obesity and diabetes. Manufacturers are focusing on the development of numerous plant-based protein sources that act as efficient alternatives to animal-based products, and wheat protein has emerged as one of the most lucrative solutions. However, rising debate on gluten-free diets and gluten-intolerance will hamper adoption of wheat protein. A new report of Future Market Insights, titled “Wheat Protein Market: Global Industry Analysis (2012-2016) & Opportunity Assessment (2017-2026)” offers forecast & analysis on the wheat protein market on a global level. The report delivers actual data related to the market for the historical period (2012-2016) along with an estimated intelligence on the market for the forecast period (2017-2026). The information is presented on the basis of value (US$ Mn). Macroeconomic indicators coupled with an outlook on the wheat protein demand pattern around the world have also been encompassed by the report. The report further imparts key drivers and restraints for the global wheat protein market, and their impact on regional segments included over the forecast period. The executive summary chapter, which initiates the report, offers key market dynamics and numbers associated with the global wheat protein market, along with key research findings related to the market segments comprised. The market numbers included in this chapter are a blend of compound annual growth rates, market shares, revenues, and volume sales. A concise introduction to the wheat protein market is offered in the chapter succeeding the executive summary, along with a formal definition of “wheat protein”. Elaboration of the market dynamics that include future prospects, growth limitations and drivers, and trends has been delivered in the chapters subsequent to the overview. These chapters also inundate insights apropos to bottom line of enterprises in detail, along with the fiscal stimulus and the global economy. Forecasts on the global wheat protein market have also been delivered in chapters propounding a segmentation analysis. The report has categorized the global wheat protein market on the basis of application, form, product type, and region. A comparative analysis has been offered on the market segments with regard to year-on-year growth, revenues, and market share. The market numbers relevant to this comparative analysis have also been delivered in these chapters. Regionally, the global market for wheat protein has been branched into Middle East & Africa, Asia-Pacific excluding Japan, Japan, Europe, Latin America, and North America. A complete package of intelligence on leading participants supporting expansion of the global wheat protein market has been offered in the concluding chapter of this analytical research report. This chapter elucidates the competition landscape of the global market for wheat protein, providing information on key strategy implementations of the market players, their product overview, key development, company overview, and key financials. A SWOT analysis on each market players has been provided in this chapter of the report. Additionally, the geographical spread of the market players included, along with their future growth plans, intended mergers & acquisitions, overall revenues, and market shares are elaborated in detail in this chapter. The report has employed an intensity map for portraying key market players located across geographies.